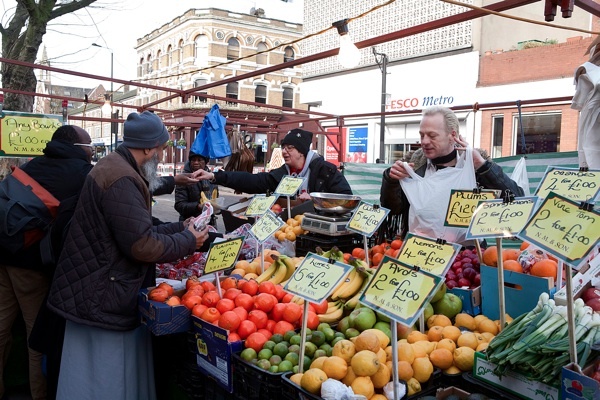 If you are looking for high quality fruit & veg with a touch of swagger, then – on Wednesdays, Fridays and Saturdays – Bethnal Green is the place to be, when Michaela Cucchi is stalling out. And from personal experience, I can vouch that the only Bramley apples of any reasonable size and quality – an unexpectedly scarce commodity – that I have found in the East End this season were discovered at Michaela’s immaculately ordered stall. 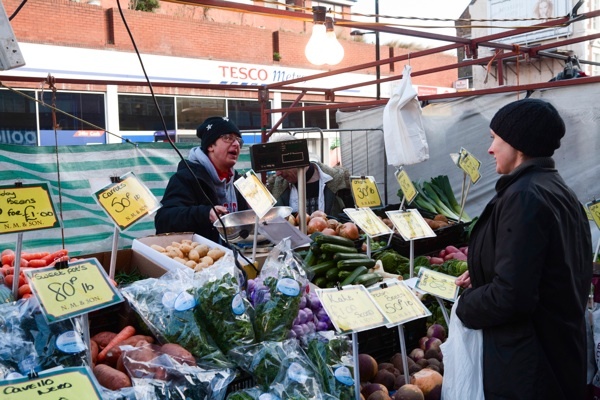 With her woolly hat pulled down over her ears, her broad smile and her indefatigable humour, Michaela is a popular character in the Bethnal Green Market. Shrewd and streetwise in the way that only those who have been in the markets for generations can be, yet possessing a certain Latin flamboyance which attests to her Milanese father, Michaela proved to be a natural storyteller when I sat down at a table at Pelliccis with her and her partner, Narve Dearan, recently. Significantly, Michaela found her way back to Bethnal Green after exploring the wider world and other professions. Simultaneously a sharp businesswoman and a born romantic, she won satisfaction by picking up the threads of her family’s tradition of market trading in the East End. “Market trading has always been in my family since the days of my grandfather, Henry Smith, and his generation. He was from Bethnal Green, one of thirteen children, and he became a rag and bone man. His brothers ran a second hand shop down the Bethnal Green Rd and a stall in Cheshire St on Sunday. They used to do house clearance, it was called totting, and they looked in the Jewish Chronicle to see who had died and went round and offered to buy the diamonds. They weren’t exactly the most honest of people years ago. My nan, she ran the Bishop Bonner and the Bonner Arms, and she had a shop in Bethnal Green where she did sewing. They had four children, which was – my mum, Shirley Smith, and then Ethel Smith, Brenda Smith, Sylvie Smith and Henry Smith, who took over the business. All the women became machinists, but my mum wanted to travel and better herself, and on a number eight bus she met my father Giovanni Cucchi. He was here studying English but he spent most of his time in the cinema watching Tom & Jerry. He proposed to her and she said ‘No’ because he was five years older than her, and she thought it was wrong. Eventually, they married at St Mary of the Assumption in Bethnal Green and moved to Italy, to Milan. It turned out my father’s father owned most of Milan, he had a big distillery that made liqueurs. During the war, he smuggled Jews into Switzerland. He built a false wall in the warehouse with flats behind it and, when the coast was clear, they filled the sugar barrels with sugar but underneath was a false bottom and they hid a person there – and that’s how they smuggled them over the border. He was very well connected and went to a ball in Argentina with Eva Peron. He was so well respected that no-one in Milan would take any money off my mum when she went shopping. But then my nan had a major heart attack and my mother said, ‘I’m going home.’ It was after I was born. So we came back to Bethnal Green. Out of all locations in the world I could have ended up, I ended up in Bethnal Green! My nan passed away, and the family said to my father, ‘Either you stay in Milan or you go to London and give it all up.’ So he came to London. It was his love for my mother. He started up a business under a railway arch importing wines and spirits, and he was the first to import San Pellegrino into this country. I never spoke English until I came here. I went to school at St Anne’s in Spitalfields and Bishops Challoner’s. Then I worked for an estate agent in Pall Mall. After a couple of years, I left and ended up buying Bennetton for Selfridges. I bummed around for a while, and went off to America and lived on Fire Island. Then I came back and met Narve Dearan. I started working for his mum at her pub in Mile End. I came back from America for two weeks holiday but I never went back. It was love at first sight. 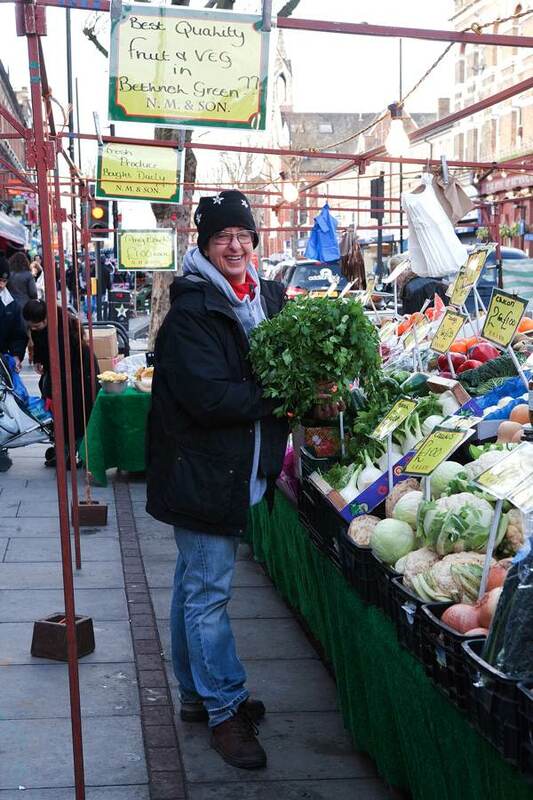 The reason we started the stall is because its hard to buy good quality fruit & veg. We buy everything fresh everyday. We don’t have a warehouse. 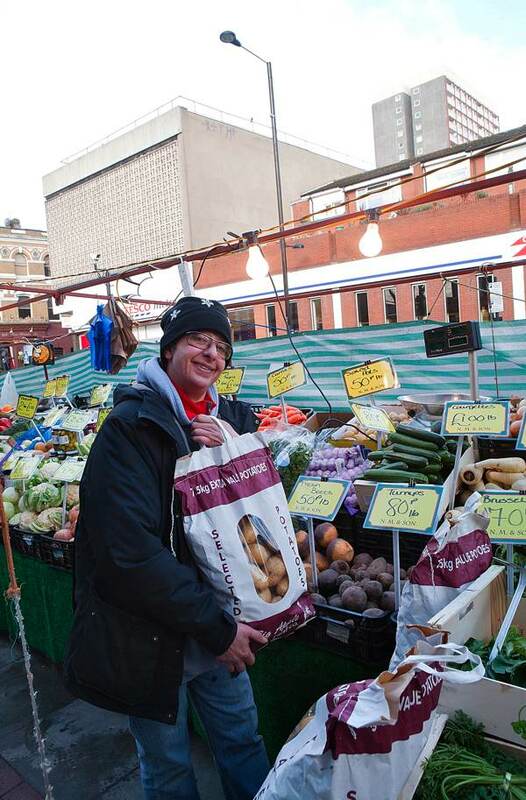 Narve spends four hours buying produce at the Spitalfields Wholesale Market and then comes back to Bethnal Green to set up. It’s very physical and it’s very hard work, and there are winter mornings when you don’t want to get up, but it’s not so bad in the summer. I go to bed at eight or nine o’clock. Narve gets up at midnight and I get up at five to do the cleaning, then I get our son Sean up – he’s twenty-three – and I take the dog for a walk before being down at the stall at six or seven to set up. 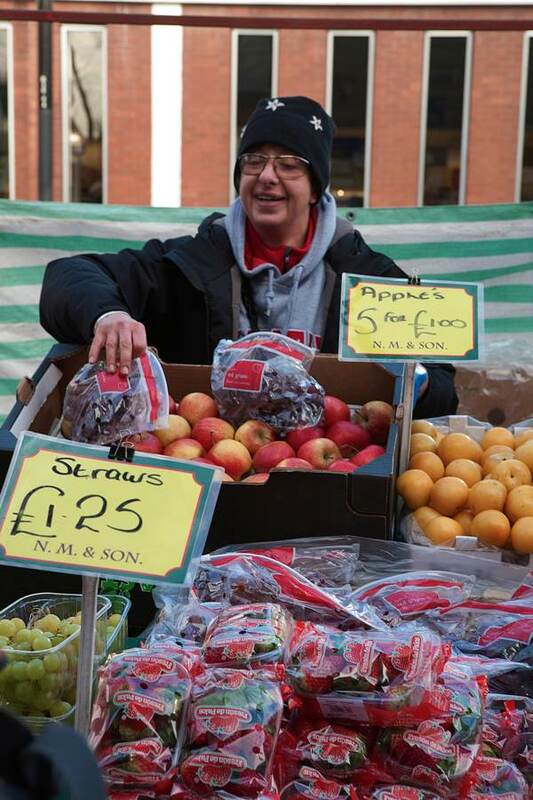 I always admire market traders – what a tough life, especially in winter. But what would we do without them: they often sell quality goods. Great story. What a lovely lady, and a great family story. I wish I lived close so I could meet her. I read in the news these days that eating well is something only the wealthy can afford to do. But retailers like Michaela and Narve prove that is not remotely true, bless them! I’m full of admiration and envy for this lovely lady. These insights into the every day folk are brilliant. I’ve bought fruit and veg off this lady many times, but I had no idea of her heritage and background. The thing that struck me about her is her wonderful manner with the customers – she always beams and calls me “angel”. The Bishop Bonner crops up again! Her nan must have run it just after my grandad – he left it in 1925. I admire Michaela and Narve’s tenacity – they obviously love what they are doing. it must run in the familly as Narve`s greatgrandfathers familly ran all the f and v stalls in Battersea markets and uncle Jim who was totally deaf walked a fruit and veg stall around Chelsea and Knightsbridge.Nobody realises the hours thst are worked by them.I know i am mum to Narve and mum in law to micheala but i am so proud of them.Only the best for customers is their motto and boy do that keep to that. I get my weekly fruit and veg from Michaela. She’s brilliant! Always a smile and some banter and she’s always encouraging me to try out new fruit and veg. Definitely the best market stall in Bethnal Green!